Ah, so many fun things come from Scandinavia: vikings, danishes, Spotify, Ikea...and now this. Just what we need after a month of sweets, cakes, parties, and junk food: more candy! And in our house, the holiday season just ended last night. It was Three Kings Day. Some of you might know it as "Epiphany." Latin Americans often celebrate it with a rosca—a big cake full of candied fruits and a plastic baby Jesus baked into it somewhere. Tradition states that whoever gets the piece with baby Jesus has to host the party the following year. Good times. But we did without a rosca this time around. Instead, we celebrated with tres leches cake, miscellaneous libations, and...you guessed it: these soft, seafood-themed candies. 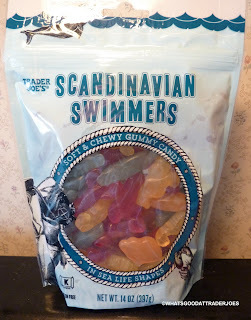 In light of recent events, Trader Joe's seems awfully confident they won't get sued by Swedish Fish over these "Scandinavian Swimmers." We see what you did there, TJ's. Very clever. You just went slightly more vague with the terms used in your product title. Why...you could be referring to Norwegian Lobsters and Danish Dolphins for all we know. And depending on who you ask, Finnish Seahorses and Icelandic Porpoises might be included in the bunch as well. Regardless of all that, I like them. I call them "Scandies." Get it? Scandinavian candies. Scandies. It's a contraction of the tw—oh, nevermind. There are four different flavors (and colors). I like all of them except the yellow flavor. It just doesn't taste like anything to me. It's vaguely sweet, but there's very little tart lemon essence or luscious pineapple or anything like that. It's just...there. I can't really identify any of the other distinct flavors either, but all the rest seem like they belong there, though none pack the sour, citrusy zing that we found in last year's Sour Gummies T's & J's. It might just be my imagination, but I think the blue (dolphin) flavor is slightly berry-esque and the orange (fish) flavor is sorta orangey. I'm not even going to venture a guess as to the red flavor. Maybe the ladies over at Candyology will eventually offer us some concrete insights into the matter. Texture-wise, they're wonderfully soft, and I must admit, my inner five-year-old thinks the shapes are kinda fun. The number one ingredient is cane sugar so, as candies go, I'd say these are a higher quality product than most mainstream offerings. Neither Sonia nor I are huge candy folks, but after being wowed by the aforementioned T's & J's, we decided to check these out as well. 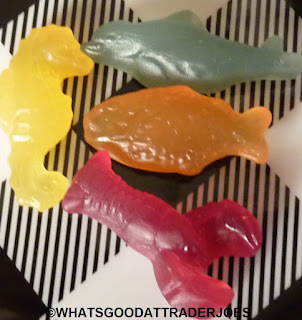 They're certainly not bad, but both Sonia and I would take the sour gummies over these guys any day. It looks like double 3.5's on this one. I might have gone with a 4 if that yellow flavor weren't so...blah. "Scandies" actually is a portmanteau, not a contraction. Those have the apostrophe. And TJ's sure knows its portmanteaus - pluots and tofurkeys anyone? And FYI, a portmanteau is a kind of contraction. WHOA! That is lots of sugar!! "There’s a blue dolphin (huckleberry flavored), a red lobster (berry flavored), a sea horse (mango peach flavored), and a rock fish (rock flavored—just kidding, it tastes like orange)." Aha! When in doubt, check traderjoes.com :) Thank you, Sudsy! I bought a bag of these yesterday. They're all gone. So chewy and tasty. And a hell of a decent bag for $2.99. I agree about the seahorses. These are just too cute to pass up though. Tasty. Bought yesterday gone today. But just not feelin' the carnuba wax! Sorry, after I clicked send, I thought maybe it was in the ingredients. What?! lol. So technically, the flavors are: blue dolphin (huckleberry flavored), a red lobster (berry flavored), a sea horse (mango peach flavored), and a rock fish (orange flavored). I think the rock fish are my favorite so far, although I prefer the sour TJ's gummies (mmmm, sour).